Reamping: How Does It Work? If you're a guitar player and have started to think about recording your instrument, you may have heard about reamping. But what is that exactly? 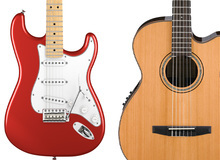 The signal of an electric guitar goes through several level stages before it is actually recorded. In a standard recording, the first level is the instrument level (or high impedance, also called Hi-Z) of the signal coming out of the guitar and going into the amp. Then, the signal is preamplified and amplified by the guitar amp and sent to the speaker(s) with enough amplitude to make it/them move. You will then have to put a microphone in front of the speaker(s); and it is the signal coming out of the microphone that will reach the mic input (XLR connector) of a mixer, mic preamp or audio interface. All these include a preamp stage that adjusts the signal so that it can be recorded by a sequencer or a recorder. First of all, reamping means recording the signal directly from the guitar in addition to the signal from the mic placed in front of the speaker. Afterwards you can use this guitar signal to feed another guitar amp or the same amp with different settings. This has several advantages: you can change the amp settings or the microphone type and position after recording. If you don't like the sound of the amp you originally recorded with, but the performance of the musician is brilliant, you can track again without having to ask the guitarist to come into the studio again. This also allows you to stack the sound of different amps to get a huge tone! Reamping is recommended for home-studio owners and guitar players that work alone because they can first concentrate only on their playing, and then on the sound. There's a right time for everything! It goes without saying that the direct guitar signal must also be adjusted to makes sure that it matches the requirements of the recorder or sequencer. Use a DI box that adjusts the signal's impedance and level while balancing the guitar signal. 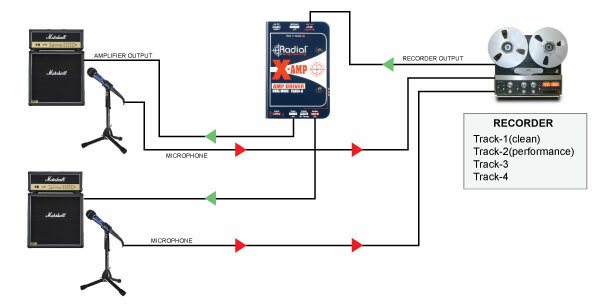 The goal is to bring the instrument signal level to microphone signal level in order for it to match the mic input (XLR connector) of a mixer, a mic preamp or an audio interface. But how do you get the guitar signal back into an amp once it has been recorded? Some use a reamping box, which does the exact opposite of a DI box: it changes the line-level signal of your recorder/audio interface to an instrument-level signal that matches the input of your guitar amp. Some people don't even buy such reamping boxes and consider that adjusting the output level of the recorder is enough. It's worth giving it a try! You can find reamping boxes from Radial, Palmer or Little Labs.